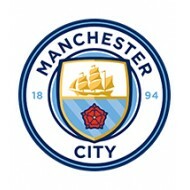 Founded in 1880 as St. Mark's, Manchester City have risen to the top tier of English football in recent years. With a legion of loyal fans, The Blues play out their football games at the City of Manchester Stadium in front of capacity crowds and here at TotalSports we’ve got the latest football kits for you to wear while you're singing and chanting your favourite team to victory. Available in kids, infants and adult sizes, the latest 2018/19 Manchester City kit can be personalised in any way you want. Have your own name on the back of the strip or one of Man City's talented superstars. Childrens Manchester City Away Kit 2018/19There’s no stoppin..
Show your support for the 2017/2018 Premier League champions.. This children's Manchester City Away Kit 2017/18 comes in a ..
Let your little one show their support for the boys in blue ..